I was sitting at the table in my sister-in-law’s house last weekend when I glanced out the patio doors and what I saw made me pause and stare. When I exclaimed, “I see the pearly gates,” everyone jumped with anticipation to catch a glimpse! 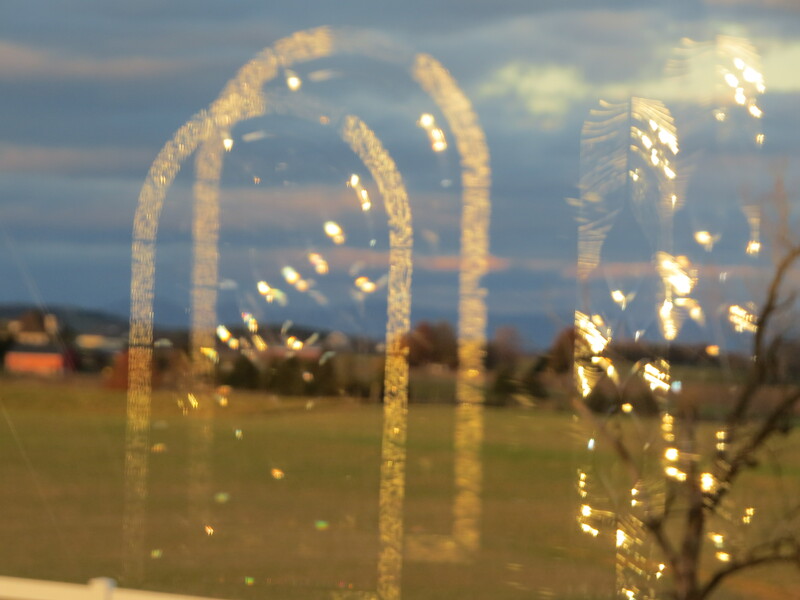 There they were; beautiful, decorative, dual arches of pearly gates! It took us a moment to figure out where the reflection was coming from. The sun was shining on the front door that has a decorative glass insert at just the right angle to reflect on the patio doors that were across the living room and dining area. It is not a straight line across the room, but somehow all the right reflectors lined up to give us an imagery of pearly gates! It was neat even if it was a pathetic simulation of “the heavenly pearly gates”. I have been thinking about those heavenly gates ever since. One day my eyes are going to lock onto the most spectacular gates of pearl imaginable and I suspect I will gasp at the wonder that is before me. There are many pearly gate jokes with St. Peter as the keeper of the doorway. You have to convince him that you are worthy for him to unlock the gate and let you slip in. But scripture gives us a different visual. In Revelations 21 there is a description of the New Jerusalem coming down from heaven. It is an immense and beautiful city with a wall built of jasper and twelve foundations of different gems. There are twelve gates, each made from a single pearl and the street of the city is pure gold like transparent glass. (Revelations 21:21). This city descends from God, out of heaven, down to the new earth (Revelations 21: 1-2). Contrary to popular belief, the gates do not bar entrance to the city as they are never shut. However, these gates can only be entered by those who have been redeemed by the blood of the Lamb, Jesus Christ. “Nothing unclean will ever enter it, nor anyone who does what is detestable or false, but only those whose names are written in the Lamb’s book of life” (Revelations 21:26-27). Those pearly gates will be a dazzling sight. I visualize Jesus standing there with arms outstretched before the wide open gate as I run and fall into his embrace. There is so much about heaven we do not know and understand. We catch glimpses in scripture of its beauty and glory. The details are not important, but what is important is to believe in and know Jesus Christ as your redeemer. Jesus is the only way to the Father and heaven. There is no other. Jesus told us plainly, “I am the way, the truth and the life. No one comes to the Father except by me” (John 14:6). Just a few thoughts for further reflection. To my surprise when I got studying and looking at scripture on the pearly gates I discovered that I had adopted some of the “religious” myth about the gate. There actually is very little scripture about a gate to heaven. The “Pearly Gates” are associated with the New Jerusalem which comes down from heaven to a new earth when the present earth is destroyed. There are twelve gates, one for each of the twelve tribes of Jacob (Revelations 21:12) in the walls of the huge city which is shaped as a cube; three gates on each side. Scriptures says these gates will not be shut at all by day for there is no night there but only those who names are written in the Lamb’s Book of Life will be able to enter. (Revelations 21:25-27). To my surprise, I could find no mention of entering a gate to heaven when I die! People who have had “after life” experiences report seeing a brilliant, intense, bright light and being drawn to it. Most see a beautiful gate with people gathered to welcome them home. It is beautiful, comforting imagery. Whether or not it is totally true does not matter. We do know heaven is real and beautiful beyond what we can imagine. Jesus will be there to welcome his loved ones home. Wow! What a night! Has there ever been an election where so many people had so much raw emotion and passion at stake in an election? But this morning I want to pause and express a few feelings. I have never before blogged about politics and only once this season did I make a single statement on fb, though I was tempted many times. We are all open to our views and beliefs; that is the beauty of democracy. But now I want to say that I, personally, want to be respective of the opposing “blue” side. After all, some of you are my friends, customers and relatives. You are real people, with real faces and feelings, who didn’t vote as I did or see the world through the same lens. I love and care about you and your feelings and do not want to arrogantly flaunt our win or your loss with contempt, unkind words or a mean-spirited attitude. It is time for a change. Will the “Red Team” be perfect? Absolutely not. Is there corruption in their ranks? Unfortunately, yes. Is Donald the perfect candidate? No. Will he make mistakes? Of course? Do I approve of everything “the Donald” says and represents? No. Is he a threat to our nation and the world? Of course not. Mr. Trump has built his whole platform on taking back America for the people. He understood and heard the call of the people of the heartland. He owes no man anything as he basically funded his own campaign. He triumphed in a historical election against unbelievable odds. I prayed often and passionately for this election. God knows and sees the long-view. I can only see the present. So, I prayed for His will for our land. 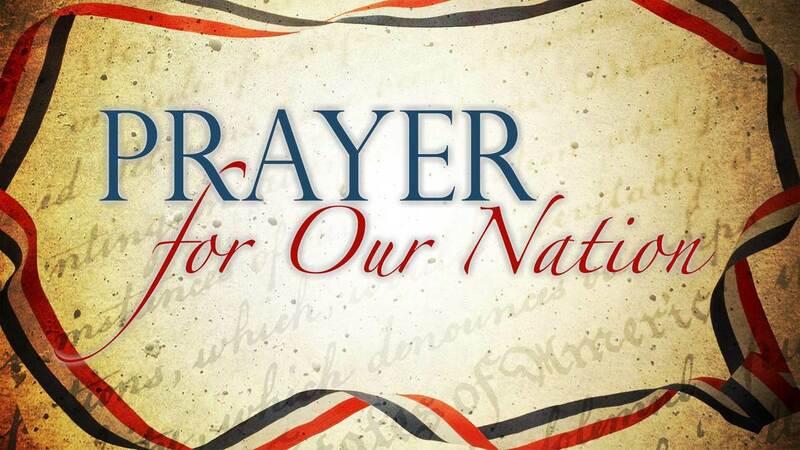 I prayed for mercy and that people would humble themselves and turn to God so that He could heal our land. I prayed that the God-given right to be born would be protected and cherished. I prayed that the Constitution and laws of our land would once again be honored, obeyed and enforced. I prayed for the right to express our faith without fear and intimidation. I prayed for God-given justice. I prayed that the hidden, dark secrets of corruption would be revealed. I plea with all of us, me included, that we guard our tongues and that no corrupt, evil, unkind, belittling, untrue words spout from our lips; that we guard against pride and arrogance. I pray that we respect the differing views of others. Yes, the victory was sweet last night and we celebrate that win. I voted for Trump but not because I approved of everything he has and probably will say and do-far from it. I voted for him because of his policies. I voted for him because I feel change is desperately needed in this country. I see him as a man who will stand against the status quo. I see him as a man who can help our country become more fiscally sound. Was he the best that our country could offer? I don’t know. But he prevailed through the vetting process and has come forth as “the man” for this hour and this time in our nation and world. I want to pray that Trump will have wisdom for the huge, almost insurmountable task before him; that he will be God honoring and humble, not vindictive or careless with his words and actions. I pray for his family and marriage. I pray for God ‘s protection, care and blessing on him as he prepares to lead our nation and navigates the troubled, stormy waters of international affairs and tensions. I pray that he will seek to know and understand the heart of God. I pray also for Hillary as she is experiencing the disappointing and crushing blow of defeat. I appreciated both her and Obama’s gracious tone this morning. I pray that she will search her soul with the truth of God’s Word and yield to His redemptive work in her life. A new day has dawned and new opportunities lie before us. As a nation, we will need to come together for our common good or we will stay entangled in a bitter web of confusion and partisan politics. These two foods rank extremely high on my list of favorite foods. I can chow down and make a whole meal of a big bowl of either one. Before you turn up your nose, let me tell you about this delicious, hearty, salad green and I will also share my recipe at the end of this post. I grew up on both of these salad greens. As a child, we never ate cooked collard, kale, mustard or turnip greens as Mother was more of a “northern” cook! I am finding most people around here have never heard of endive and have no idea they can eat the dandelion weed. Endive salad is a “must have” standard at my (the Heatwole) families Thanksgiving and Christmas dinners. This is an early spring delight. You gather the dandelion BEFORE it shoots a bloom or it will be bitter. With a knife, very carefully dig up the stalk but not the root. The hardest thing about dandelion is cleaning as it tends to be fragile and dirty. Endive is planted and grown from a seed just like lettuce. It forms a loose, upright head, a lot like Oakleaf lettuce. I planted it the end of August and we have been eating on it for weeks. It regrows after it is cut and light frost does not hurt it. 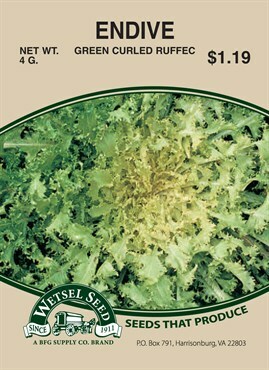 I plant Green Curled Ruffec Endive from Bfg Supply (Wetsels). Put in sealed container and shake together until mixed. Pour in skillet with bacon grease and cook over medium-high heat until thickened. This only takes a few minutes. Pour warm dressing over greens. Eat immediately. I have found that if I have some left over, simply refrigerate. I even like it cold the next day for lunch. Serves 4 or if at our table, 2 people!!!! One helpful hint: I buy 3 lb. packages of thick-sliced bacon and fry it all up at once. After it cools slightly, I chop it into small pieces and freeze. I save some of the grease in another container and freeze especially when we are in endive season. It doesn’t seem as big of a job to make the salad if you don’t have to fry the bacon every night. I have found it is also really, really handy to have the bacon on hand to add to snaps, scrambled eggs, salads, etc. So, how many of you know about the “joy” of endive or dandelion salad? Respond in the comment section. I would love to hear your story!